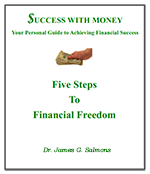 Success With Money offers free financial education for anyone who will take advantage of the opportunity. As simply and directly stated as possible, my mission for this web site is to help as many people as possible to become as successful as possible with their money. This is an educational undertaking, but it is designed to help people to do, not just to know. If you want to make real change for the better and you are willing to do just a little work, I am confident that you can experience enormous financial success by applying what you find here. Never before have so many people been so successful financially; never before have so many been slipping into financial chaos. The good news is that success with money is possible for anyone who is willing to learn and will take the simple steps required. Literally millions of people are becoming wealthy. It is reported that over fourteen million Americans are now millionaires! But at the same time an even greater number are being swallowed up with credit card debt, home foreclosures and bankruptcies. No matter where you stand on this continuum, the good news is that success with money is possible for anyone who is willing to learn and will take the simple steps required to benefit from the basic laws of money that control our lives financially. In order to make it easy for everyone to succeed in reaching these goals, I organized the information you need to know around The Essential Laws of Financial Success which you can find on the navigation section titled “Money Laws.” In this section I present a series of articles explaining each of these laws. Next I developed step by step plans to apply these concepts and suggest specific action steps to help us put these laws to work in our individual lives. The most important of these to begin with are the ones under the section titled, Take Control. The Success With Money Action Newsletter encourages people to take specific steps month by month, consistently building on each step until they have achieved complete success with their money. In order to support your implementation of the whole process most effectively I chose to publish a newsletter, the Success With Money Action Newsletter. It is a tool to encourage people to take specific steps month by month, consistently building on each step until they have achieved complete success with their money. Each year I renew the cycle building layer upon layer, helping people progressively become more and more successful with their money. Learn more about how you can get in control of your money, get rid of credit card debt, find money to save and invest, and do so wisely and productively. Discover real financial freedom for you and your family. Sign up now to receive our free newsletter. Note: I promise that I will absolutely never use your registration information for anything other than for its intended purpose, to deliver to you our monthly newsletter and to send an occasional related informational bulletin. It definitely will not be made available to any other party. This site, Success With Money, is a free educational site aimed specifically at the goal of helping people become successful with their money, just as the title states. I am not interested in selling insurance, promoting investments of any kind, making loans, or advocating for so called debt reduction services. You will be out no expense to take advantage of the information on this site or our monthly vehicle of communication, the Success With Money Action Newsletter. The only items that I would ever ask you to pay for, and these are all optional extras, would be extended reports on specialized topics or other resources I might recommend for additional study such as books by other authors. And you can count on me to do my best to make them available at the lowest cost possible cost when they are made available on the site. This site, Success With Money, is a free educational site aimed specifically at the goal of helping people become successful with their money, just as the title states. While the use of these special reports and other special resources I might recommend could definitely be helpful and worth your investment (otherwise I would not recommend them), they are not essential. I want you to use this site and read the newsletter with no sense of obligation. I really hope you will. I am focused on putting all the basics up right here for you to have at no charge whatsoever. Every day I am confronted by people struggling with money solely because they don’t know how to do any better. Nothing gives me more pleasure than the idea of people turn their lives around using the principles I teach. My goal remains to help as many people as possible to become as successful as possible with their money. I will celebrate with everyone who decides to take control of their money and reach more of their potential financially. You can begin learning today by reading what we have placed on the site. Start by learning how to get in control of your money. That is the essential beginning point for all success with money.